A couple whose first year of marriage was recorded for a ground-breaking TV documentary series have celebrated their 25th wedding anniversary. Karen and Marc Adam-Jones from Cardiff were followed by the cameras in the week leading up to their wedding and the year following for The Marriage. Broadcast in 1986, the series attracted 14m viewers a week. Looking back, Karen said: "It doesn't seem like 25 years," to which Marc joked: "It feels like 50!" One of the first fly-on-the-wall documentary series, The Marriage was created by Desmond Wilcox and a large production team followed nurse Karen and rugby player Marc in 1984. The couple became overnight celebrities and at one stage were so recognised they had their own puppets in the comedy show Spitting Image. One of the biggest talking points came when Marc went on a rugby trip to Scotland with a group of friends which included his ex-girlfriend - and he didn't tell Karen. "The only thing you didn't see was the shooing I got from Karen at home after," he said. "People just thought I was stupid and people were correct. You don't do something like that so early in your marriage. "It showed little thought for Karen and just my own self importance and my ego. "Speaking on BBC Radio Wales, Marc admitted he was stupid. But despite this very public blip the couple's relationship has survived and together they have four children - Nia, 22, Sara, 20, Cerys, 18, and William, 16. "It takes a lot of hard work," said Karen. "It is so easy to take the divorce route, but we are both stubborn people and we refuse to back out. "There are times when you cannot stand each others' guts and there are times when we are really happy and in love. Marc's philosophy on the longevity of his marriage is much more succinct: "It's luck," he said. 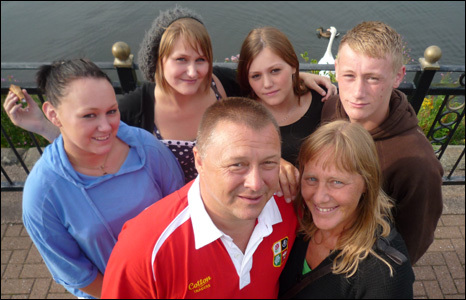 A programme catching up with the couple and their children will be broadcast on BBC One Wales on Wednesday. As part of their anniversary celebrations, the couple attempt to track down the original wedding party guests and are shocked to find out just how many people and couples have died, split up, or remarried. "Of the 120 people who came to the wedding, around 25 people have passed away, 50 children have been born to the various couples and there have been at least 20 divorces," said Marc. "I have seen people whose marriages I thought were secure splitting up. So I don't think you can ever describe a marriage as a success. You have to roll with it. "Unfortunately people grow apart, attitudes change. If that happens to us, it happens to us." "You have to ride out the bad and put the effort in."